Sinsheim - VfL Wolfsburg headed south-west on Matchday 23 with justified hopes of a third season victory over opponents they had knocked out of the at the self-same venue just a couple of weeks beforehand. Instead of further points towards the push for a place in Europe, however, Dieter Hecking's ambitious Wolves took their leave of the Rhein-Neckar Arena on Sunday evening with nothing to show for their efforts other than a 6-2 thumping at the hands of the Bundesliga's most unpredictable team this season. For hosts 1899 Hoffenheim it was a landmark success: the first time they had netted six goals in their still relatively young top-flight existence. The result also, incidentally, took the sum total of goals in their 23 league outings to date to a staggering 100. And while head coach Markus Gisdol would probably sacrifice some of that entertainment value for somewhat more regular positive results, their overall performance offered further compelling evidence that the longer-term Hoffenheim project is now truly back on track again. “It's really something special for us to beat such high-calibre opponents in this way,” Gisdol reflected. “In the first half in particular, our pressing was close to perfect and a constant problem for Wolfsburg.” By the interval, his charges were already 4-1 to the good, with a six-minute flurry late in the half producing a goal from Niklas Süle and two more from Anthony Modeste to add to Roberto Firmino's early opener. Two late strikes completed the rout, with the ever-dependable Sejad Salihovic scoring from the spot before laying on number six for sub Sven Schipplock as the clock ticked down. 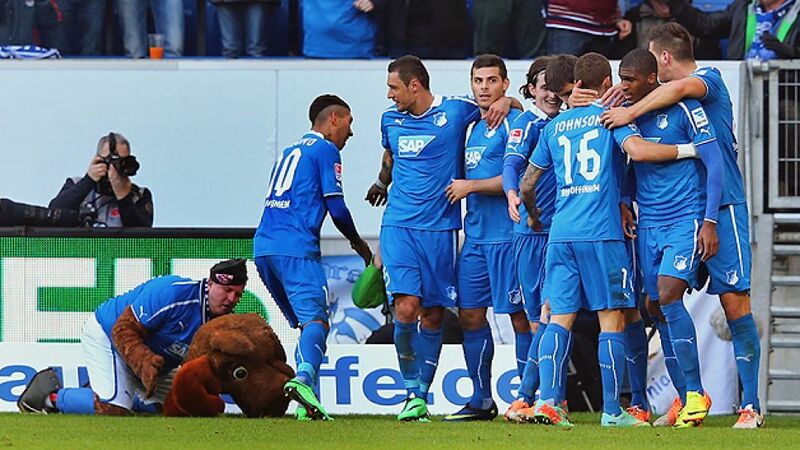 That club-record high score notwithstanding, the offensive fireworks were nothing particularly new for Hoffenheim. They went into the match as the division's third-top scorers and the half-dozen goals added to the tally against Wolfsburg takes them up to 52 for the season – just two fewer then the mighty Borussia Dortmund attacking machine. But 1899 were and remain the side with the third most porous defence as well, with 48 goals conceded in their 23 games to date. They are now on a season-best run of five games unbeaten. At least as significant, however, has been the way the side battled from behind to earn a share of the spoils at SC Freiburg (1-1) and Borussia Mönchengladbach (2-2). In the latter case, they were two down after only 18 minutes and aside from the requisite fighting spirit, the team not for the first time demonstrated their ability to adapt to a new game plan in mid-course, switching from a 4-2-3-1 formation to a 4-4-2, making far more effective inroads into the Foals' defensive ranks. For Gisdol, “that's just part and parcel of a team's tactical flexibility”, but it is nonetheless a pivotal area in which his young charges are proving increasingly adept in a ferociously competitive league. Sebastian Rudy was impressive going forward and his high pressing, together with that of the combined attacking department, was a key factor in a performance which utterly overwhelmed the high-flying visitors from Lower Saxony. Modeste chipped in with two goals and an assist, confirming that “the ability of all our forwards to switch positions and carve out scoring opportunities is one of our real strengths”. All of which is music to the ears of his coach, who noted in relation to his attacking options: “Sometimes it'll be Firmino, sometimes Modeste. You can only shine as an individual when the team are working together for the common cause – and that's some thing they've really taken on board.” So much so in fact that the side Gisdol eventually hauled clear of relegation by way of the play-offs last year are now looking like increasingly plausible candidates for a UEFA Europa League slot.